These kitchen sink orzo bowls are delicious and a new favorite go-to dinner option in our house, super flexible and you can use whatever ingredients you have lying about…you know, everything but the kitchen sink! Last week when I went to the farmer’s market I had no idea what I was going to be making for dinner that night (despite having a meal plan ready…yeah, sometimes I don’t follow it, I’m only human). I decided to see what vegetables I could find at the market and go from there. Then I came home, rummaged through the cabinets and fridge and discovered a package of whole wheat orzo. 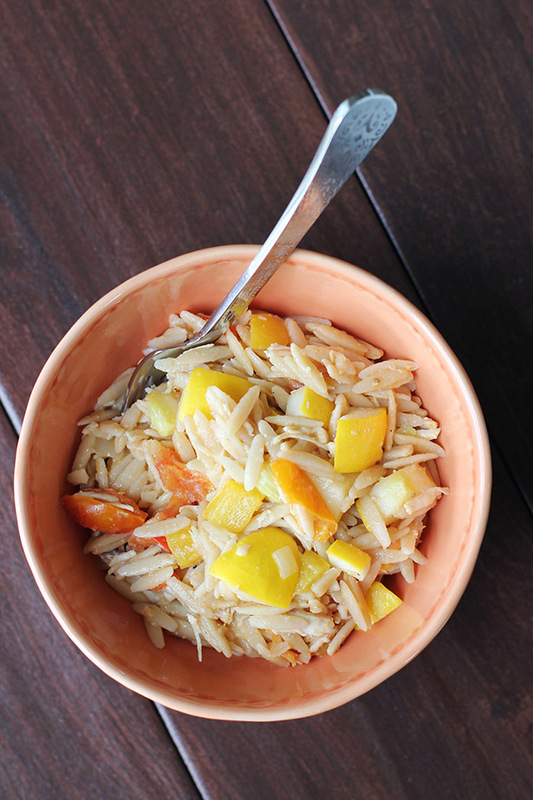 The result of all this searching and finding is today’s recipe, kitchen sink orzo bowls. This is a very flexible recipe. 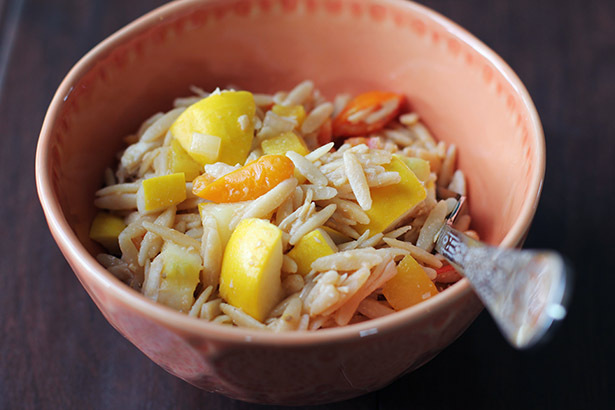 Pretty much the only ingredient you have to have is orzo! Olive oil, onions, tomatoes, salt and pepper are also pretty necessary, too, but beyond that you can throw all kinds of yummy veggies and even chicken or fish with success. As a result of all this flexibility, I don’t have any measurements for you on this recipe. I’ll describe the technique and the approximate amounts of ingredients I used and then I encourage you to take this recipe and make it your own. And your own version will probably even change depending on the season or what is in your fridge on a particular day. The final result is a very homey, tasty dish, reminiscent of a classic casserole but much healthier. If you’re craving risotto but don’t feel like cooking risotto, this is a great alternative, providing a similar texture and flavor without the long cooking process. Enjoy! Prepare orzo pasta as directed on the package. Drain, reserving 2-3 cups of the pasta water, and then set aside both the water and the orzo. I used about ¾ of a package of Delallo Whole Wheat Orzo to feed our family of 5 with some leftovers. In a deep, 12-inch skillet heat olive oil over medium heat. Add chopped onions and cook a few minutes until translucent. Add fresh garlic and cook, stirring, about 30-60 seconds. Add the chopped tomatoes. Reduce heat to medium low and let mixture cook for 5-10 minutes to really get the tomatoes to cook down. If using wine, add it now and cook about 5 minutes. Add vegetables and cook a few minutes until the veggies are al dente. (If you are using vegetables like carrots that take longer to cook, steam them ahead of time and just heat through at this point in the recipe.) If you aren't using wine and need a little more fluid in the pan, just add another swig or two of olive oil. Add the orzo to the pan. Add the white balsamic vinegar and then start adding pasta water about ½ cup at a time until you get a nice, creamy consistency. Salt and pepper to taste, adding herbs and spices if you choose. I simply used salt and pepper and it tasted great! 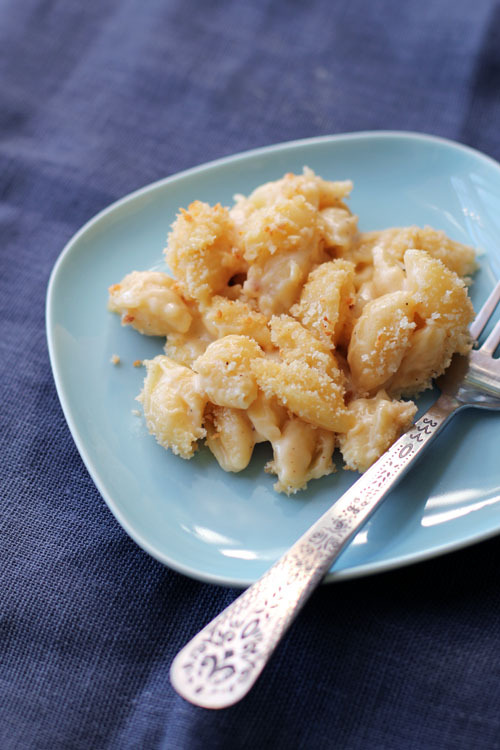 Years ago I did a Call for Recipes for homemade mac & cheese. Many tasty recipes were submitted and I’ve used several with great success. There was one in particular, though, that caught my eye. It involved the microwave and seemed almost too easy. I finally tried the technique out last week and loved it so much it deserves its own post! Cailean was the lovely person who shared the recipe with me. I checked with her and she has no clue where she got the recipe from, although there are many permutations of it online. She knows she didn’t make it up herself, but she did notice that her version doesn’t have butter, which is different than most other similar recipes. So, we’re just going to give Cailean credit. Sound good? Great! 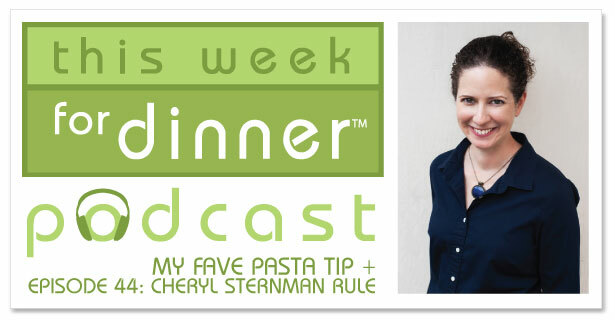 You’ll still need the stovetop to cook the noodles, but the sauce gets cooked in the microwave. I kid you not, in the time it takes to boil the water and cook the noodles you will be done making the homemade mac & cheese. 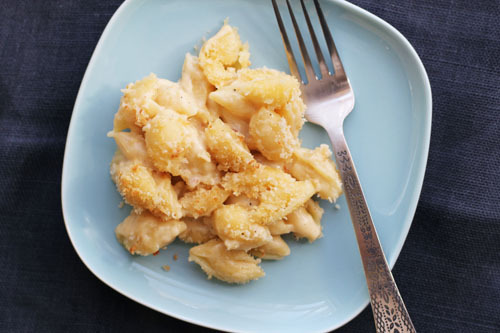 It’s super awesome and takes up as much of your time as boxed mac & cheese. Which begs the question, why would you ever go back to boxed mac & cheese after this?! Put the water for the pasta on to boil. Shred cheese. In a good-sized microwave-safe bowl, whisk together well the milk, flour, salt, pepper and nutmeg (if using). Stir in the cheese. When water comes to a boil, add pasta and cook according to package directions. 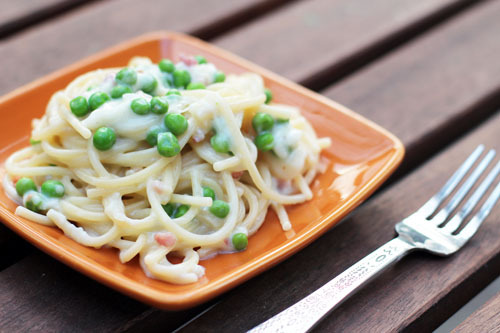 While pasta is cooking, cook the milk-cheese mixture in the microwave on full power 1-2 minutes at a time, whisking after each time. Keep cooking until cheese is fully melted and you have a nice, smooth sauce (probably about 5 minutes total). Drain pasta, return to pot then add sauce and mix well. 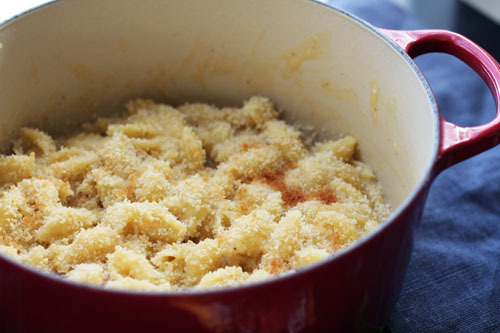 If you want to top the mac & cheese with breadcrumbs, boil the pasta in a wide, oven-safe pot (like my Le Creuset 5½ quart). After the mac & cheese is all mixed together in the pot, sprinkle evenly with panko bread crumbs (about ½ cup or so) then drizzle with butter. Place pan in oven under high broiler and cook until breadcrumbs start to brown, a few minutes. 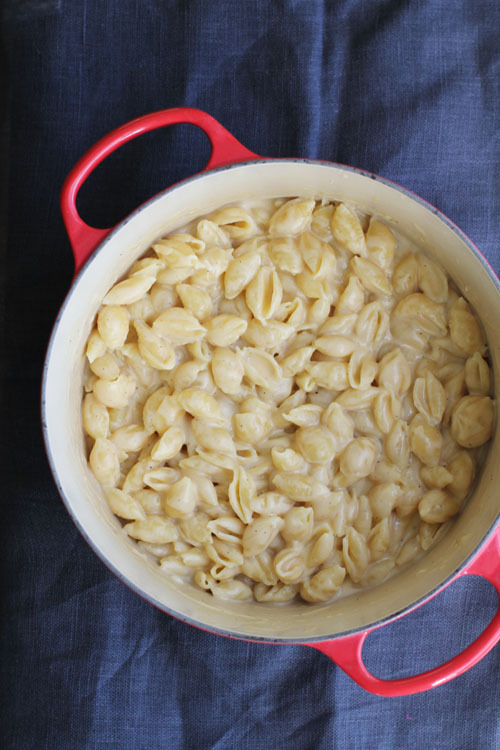 If you don't have an oven safe pot, feel free to transfer the mac & cheese to a 9" x 13" casserole dish before adding the bread crumbs and broiling in the oven. Serves 6-8. A good rule of thumb for pasta is 2 ounces uncooked pasta per person. For our very first date, Nate and I went to the Davis Square Bertucci’s in Somerville, MA. Once we were married, if we ever went out to a restaurant (which was rare), it was usual to Bertucci’s or John Harvard’s. I think one of the reasons I love Bertucci’s so much is because of our personal history associated with it, but I still love going to that restaurant whenever we can because they do make some good food. Those dinner rolls and that margherita pizza…YUMMMMM. 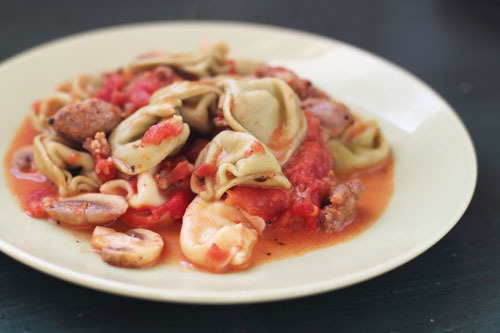 One of those times early in our marriage when we went to Bertucci’s I ordered a tortellini dish that was served with sausage, mushrooms in a light cream tomato sauce. This was one of the very first restaurant copycat recipes I created at home and definitely one of the first things I cooked that gave me some confidence in the kitchen. It’s been years since I’ve made what we call Bertucci’s Tortellini, but I threw it on the menu a few weeks ago and IT WAS SO GOOD. I made sure to write down measurements for you since the recipe I had posted on the site was pretty lame and directionless. 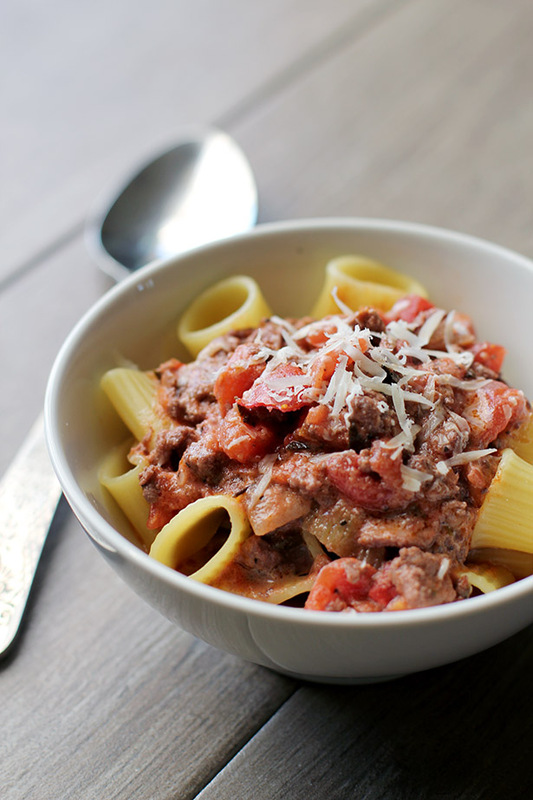 This is a nice and easy dinner to prepare that tastes wonderful. (I think I had thirds the other night.) 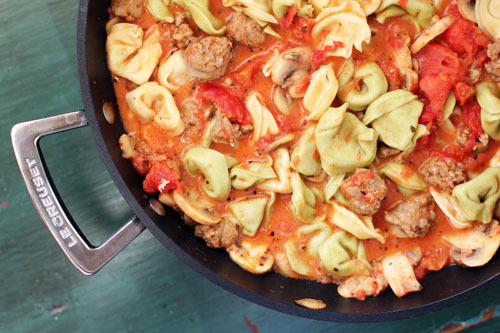 The only thing missing from this recipe is Bertucci’s dinner rolls! Spaghetti is definitely a go-to meal around here and my kids could eat it every day, much like myself as a kid. Once, when I was in 3rd grade, my dad and I found ourselves home alone for a week. We ate spaghetti every night. I thought I’d died and gone to heaven. My dad was lucky I was a clueless 9-year-old. Last week, however, I decided to try to make spaghetti more interesting. The result was delicious! I used a recipe for spaghetti carbonara from Christina Ferrare’s Big Bowl of Love cookbook and it came out beautifully. The ingredients are simple, the taste is flavorful, and the sauce is creamy without using actual cream. Nate and I both really liked this recipe. I actually loved it. The girls stuck with classic boring spaghetti that night, but I don’t think they even tried the carbonara, little stinkers. Owen, however, ate three servings and couldn’t get enough! If using fresh peas, remove the peas from their pods and set aside. For frozen, run warm water over the peas to separate them, drain, then set aside. In a cold, large, heavy pot, pour the olive oil and swirl to cover the bottom of the pan. Add the pancetta, cook over medium heat until pancetta is crisp. 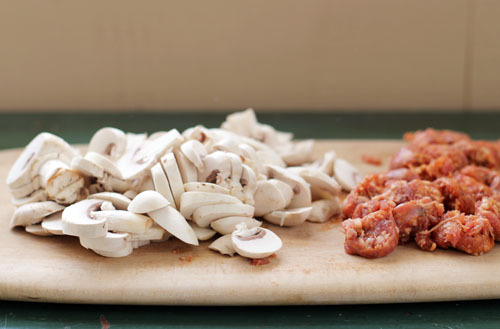 Remove pancetta and set aside. Add shallot to the pan and saute until crispy. Remove from heat, add pancetta back to the pot and set aside. I am lazy, so I cooked the pancetta then just added the shallot/onion to the pan without removing the pancetta. I added the shallot before the pancetta got crispy then cooked until the onions were softened. Once cooked, turn off heat and set pan aside. Cook pasta to package directions. Be sure to salt the water – 1 tablespoon salt per 3 quarts of water. 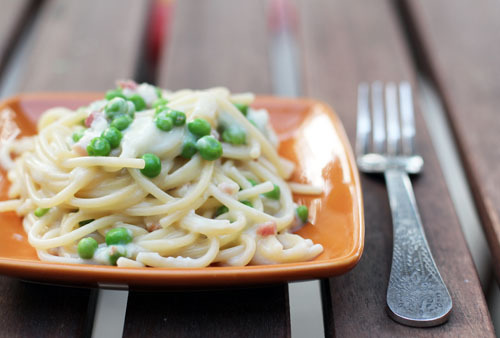 Three minutes before pasta is ready, add peas. 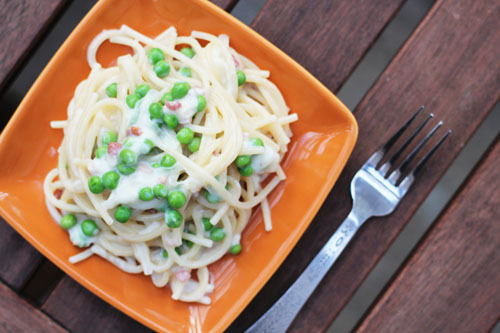 Drain pasta and peas, reserving 3 cups of the pasta water and set aside. The original recipe tells you to add the pasta to the large pot with the shallots and then mix in the sauce ingredients. I did it this way and found that the cheese was very clumpy. It tasted good, but I didn’t get a smooth sauce. So, I am modifying the directions. Return the pancetta/shallot pan back to the stove and turn the heat on to medium-high. Immediately add ½ cup pasta water, ½ cup milk and ½ cup parmesan cheese. Whisk well. Add remainder of the parmesan cheese and milk and keep whisking. 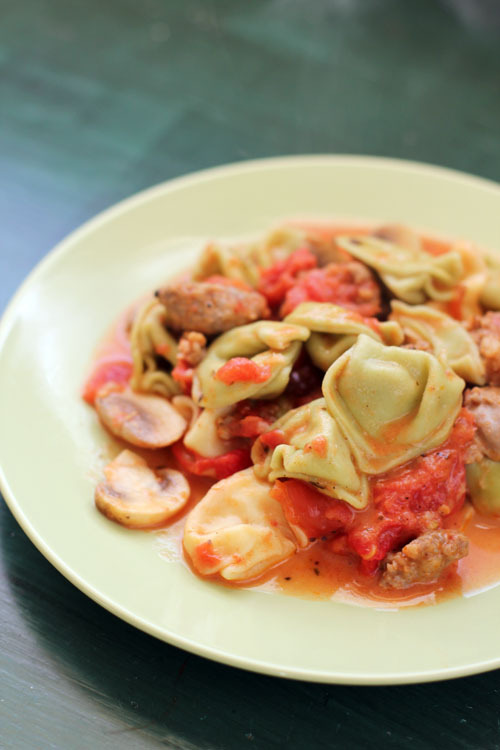 If the sauce is too thick or gooey, add pasta water ¼ cup at a time until sauce is creamy. Reduce heat to low then stir in the peas and spaghetti. Serve topped with additional parmesan cheese and mint leaves if desired. Growing up in New Jersey, I was surrounded by Italians. Literally surrounded. Three Catholic churches in our small town, 4 or 5 Italian restaurants in a 1/4-mile distance (keep in mind, there is just one traffic light downtown!) and last names like Pagnani and Martorana galore! 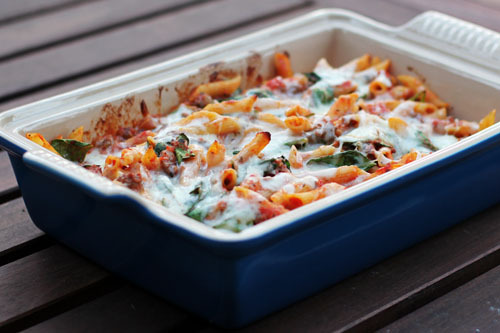 Living around so many Italians meant lots of Italian food at community and school parties, specifically baked ziti. Baked ziti is to New Jersey as funeral potatoes are to Utah. Needless to say, I ate some really delicious baked ziti growing up. Which makes it all the more disappointing that almost every time I’ve tried to make it, it just isn’t up to snuff. Well, I tried a recipe from my Real Simple | Best Recipes cookbook and I’ve finally found my winning ziti recipe! Woohoo! Move over, Italian mamas from New Jersey. In case you are wondering, the recipe is also really easy to make. I wouldn’t have it any other way. Drain cooked pasta and add it back to the pot. Heat olive oil over medium heat in a large skillet. Cook onion until soft and clear (4-5 minutes), then add garlic and cook about 1 minute more. Add the beef, ¾ teaspoon salt, ¼ teaspoon pepper and cook, breaking up the meat, until the meat is cooked through. Pour meat mixture into large pot of drained pasta. Add sauce, spinach, ricotta and ¼ cup of the Parmesan cheese. Transfer to a 9Ã—13 casserole dish. Sprinkle with mozzarella cheese and ¼ cup Parmesan cheese. 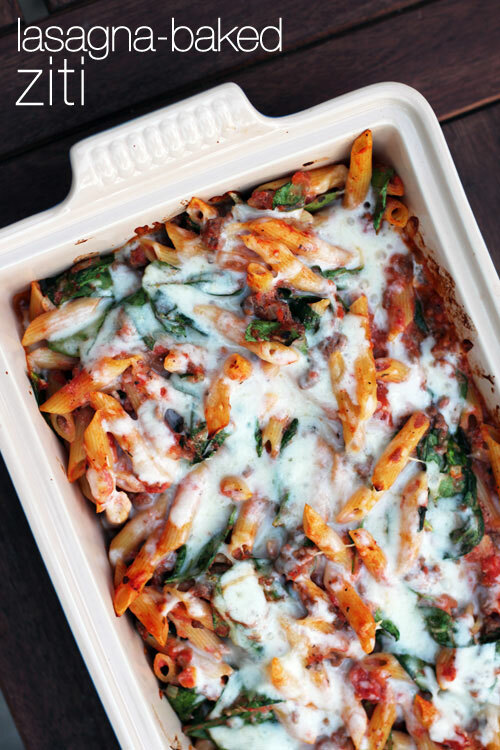 Bake until ziti is hot all the way through and cheese is melted, about 15 minutes. I have two stories of Italians from New Jersey for you today, both of which culminate with a delicious, easy go-to recipe for you! 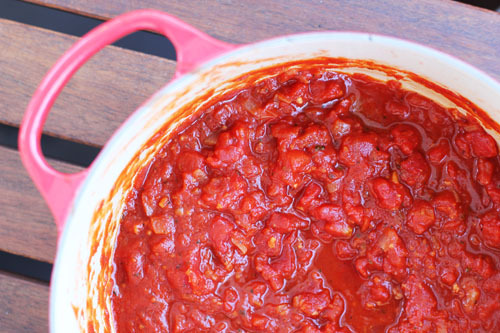 When I was in high school, a native-New Jersey Italian from church taught all the teenagers how to make tomato sauce. It was fast, it was easy, it was fresh-tasting and delicious. And when Mike was teaching us how to make that sauce, I’m sure he thought we weren’t paying attention. But I was and the technique stuck with me from then on. He just simply sauteed garlic and onion in olive oil, added some canned tomatoes and tomato paste, a few spices and that was it! On to the second story of Italians from New Jersey. A few years later when I was in college, my friend Patti was talking to me one day about how her new roommate didn’t really know how to do anything, you know, like pay bills, do laundry, all that “adult” stuff. I’ll never forget the culminating comment, “She can’t even throw together a simple chicken parmesan!” Spoken like a true Italian from Jersey, no? Anyway, when she said that to me, I just nodded and said, “Yeah, that’s crazy!” but inside I was thinking,”Hmmmm, I wonder how you throw together a simple chicken parmesan?” Thanks to Patti, I figured it out and it became one of my classic go-to meals. Which brings us to the promise of this post…an easy, go-to recipe! 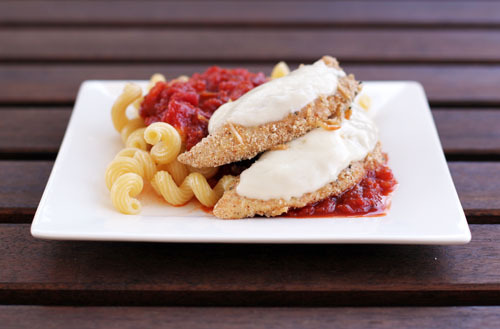 This chicken parmesan recipe is a great one to have up your sleeve. Essentially all you need is a couple of eggs, some bread crumbs, frozen chicken, pasta, a few basic spices, parmesan cheese and Hunt’s tomato paste and petite-diced canned tomatoes. Yes, I’m working with Hunt’s. 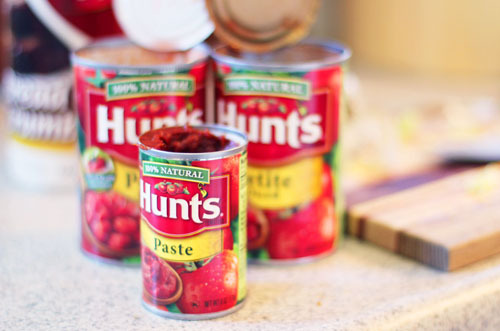 And, yes, I actually do always have Hunt’s petite diced tomatoes in my cupboard, even before I started working with them. I love the petite diced tomatoes. They are perfect for making sauce and the FlashSteam process makes the tomatoes taste flavorful and fresh. You would never guess my sauce is made from canned tomatoes! 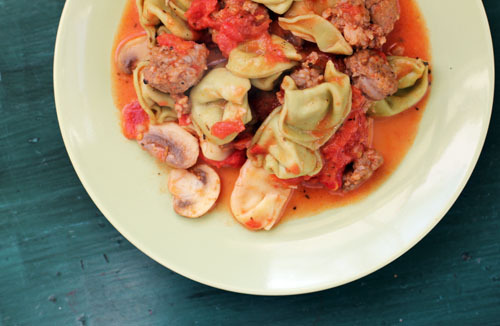 So, get your cupboards stocked up and “go to” this recipe next time you’re in a dinner bind! Whisk the eggs in a soup/cereal bowl. In another cereal/soup bowl, mix together the bread crumbs, parmesan cheese, salt, pepper, paprika, oregano and basil. Dip each raw chicken tender in the egg to coat, then place in bread crumbs and coat well. Place on lined cookie sheet. Cook for about 15 minutes, until they are JUST cooked through. Top with mozzarella cheese sliced and cook until cheese is melted, about 2-3 more minutes. Note: I usually start cooking the sauce before I start prepping the chicken, so it can simmer while I make the pasta and chicken. From Jane Maynard, thanks to Mike’s inspiration even more years ago! Heat olive oil over medium heat. Add shallots/onions. Cook until soft, a few minutes. Add garlic and saute for about a minute. Add tomatoes, tomato paste, sugar, salt and pepper. Bring to boil, then reduce heat to the point where the sauce still simmers (usually medium-low). Simmer for 15-20 minutes. While the sauce is simmering, you can smash the sauce up a bit with a ricer or pastry blender, to break up some of the tomatoes. I like my sauce chunky, so I just do this a little bit. 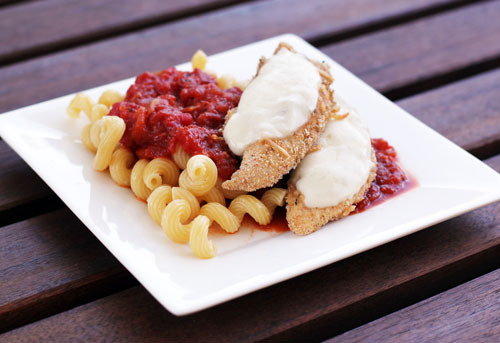 Serve chicken with tomato sauce and cooked pasta. My mother-in-law Pat made a super yummy orzo salad for us on the Cape last week. It was simple and oh-so-tasty. A definite keeper of a recipe and perfect for summertime! Pat said normally the feta is all mixed in, unlike what you see in the photo. But a certain brother-in-law of mine doesn’t like feta (what the what?!?! ), so we sprinkled it on top so Cuyler could pick it out easily. I’ve said it before, I’ll say it again, Pat’s a good mother-in-law. 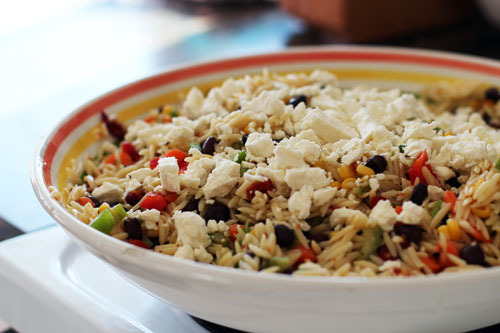 Mix orzo with dressing once it has cooled a bit, breaking up any clumps. Refrigerate while you put together the other ingredients. 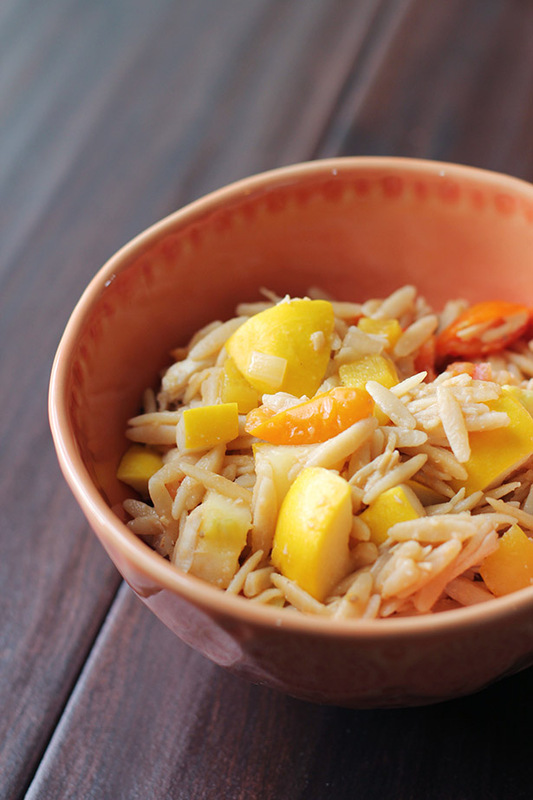 Combine with orzo and refrigerate to combine flavors. Can adjust by taking away any of the above ingredients and adding others such as grape tomatoes, shrimp, cucumber,green onion or black olives. 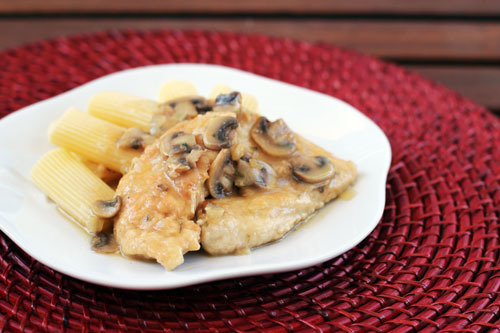 As you know, I was looking for chicken marsala recipes a few weeks ago. 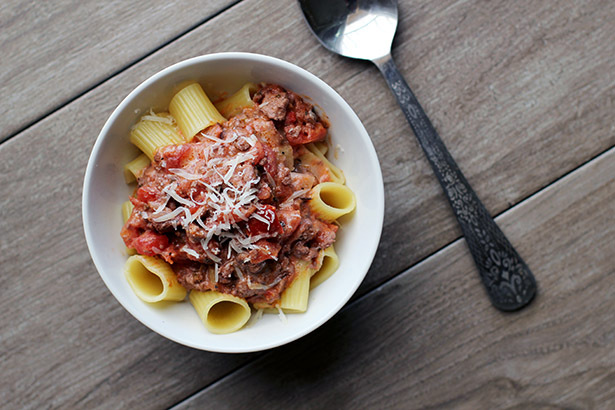 It really is one of my favorite Italian dishes and, surprisingly, I’ve never tried making it from scratch. A few of you shared some delicious looking recipes – thank you!! I’m excited to try them! 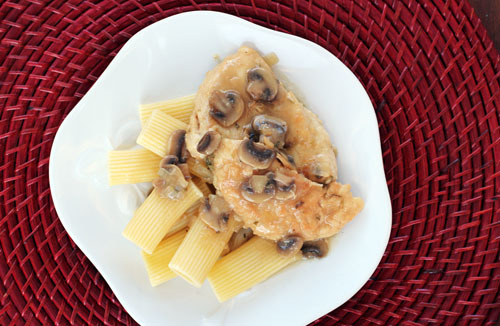 For my first pass at chicken marsala, I used the Cook’s Illustrated recipe combined with a few of the recipes that you shared. The result was a delicious, solid recipe that I will definitely be making again…after trying out a few of the other recipes you shared, of course! 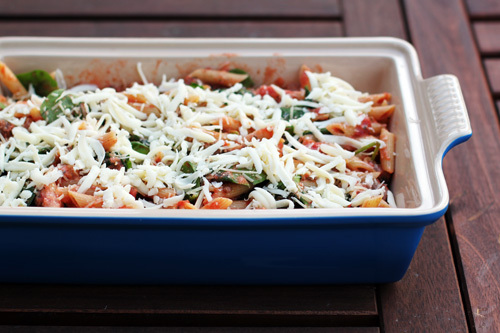 Place an oven-proof dish in a 200 degree oven. Mix flour, 1 tsp salt and ½ tsp pepper. Dip chicken pieces in flour to cover and shake of excess. Heat 2 tablespoons oil in a skillet over medium-high heat. Place a few chicken pieces in pan in one layer and cook until starting to brown, a few minutes. Flip and cook until lightly browned on side 2 and chicken is cooked through. Place in oven and repeat the process until all chicken is cooked, adding oil if needed between batches. You’ll want to reduce the heat of the pan to medium during or after the first batch. Add a bit more oil to the pan then saute mushrooms and onions until soft and mushrooms have released their water and the water has evaporated, stirring occasionally. Stir in garlic and, if you are using dried parsley, about 1 tsp parsley. Cook for about 1 minute. Remove pan from heat and add the marsala wine and broth, deglazing the pan, then return the pan to high heat. Bring to a boil and let simmer, stirring occasionally, until sauce is thickened, about 5-8 minutes. Stir in accumulated chicken juices and whisk in butter. Season with salt and pepper to taste and, if using fresh parsley, add 2 tablespoons parsley. Add chicken to pan and simmer on low heat for a few minutes.